FUENDETODOS AREA – EL PLANERON – QUINTO DE ERBO – LOS MONEGROS – VELLE SE HECHO VIA JACA What a fabulous day! Although it started a bit gloomy and there was a cold wind at Fuendetodos it turned out really nice and by mid-afternoon it was hot and sunny, the birding was excellent too! A Golden Oriole woke me from my slumber then all hell broke loose as hundreds of sparrows, Greenfinches, Serins and Collared Doves woke up. We began the day at 7am with a walk around the lanes next to the hotel on the edge of a lovely village called Fuendetodos which is the birth place of Goya and means in the middle of nowhere. Which is somewhat true, you only have to walk a few hundred meters and you are out un the sticks. We passed a pond with ‘dodgey ducks’ and both Black and Mute Swans on it, “I don’t think so” was my reply when asked can we tick them. However, the Serins, Greenfinches, Crested Larks, Red-billed Chough, Turtle Dove, Carrion Crow and Eurasian Hoopoe were quite acceptable. We got glimpses of Golden Oriole before we returned to the hotel for breakfast. We were on the road before 9am our first venue was the pseudo-steppe at El Planeron, this huge protected area is managed for larks, especially Dupont’s Lark. We knew we had a very slim chance of that one but 7 others were possible along with several other interesting species. 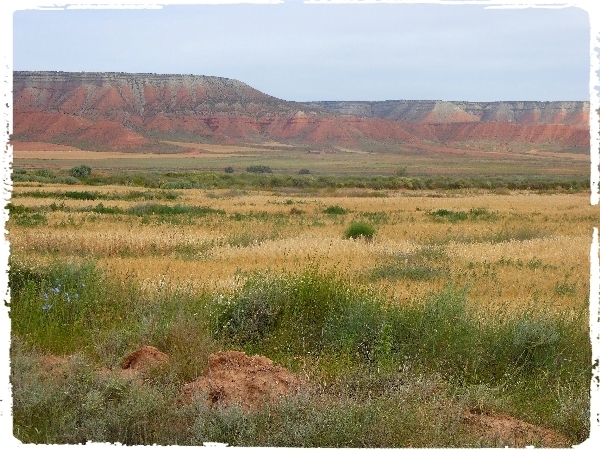 The group loved the reserve, the surrounding hills are spectacular in the morning light, a superb range of colours contrast nicely with the steppe and the cultivated fields. 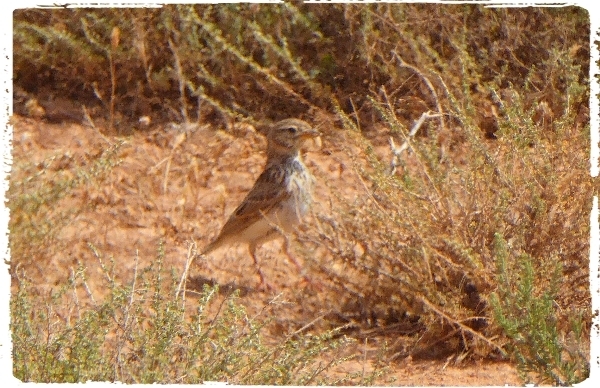 We had larks coming out of our ears, singing, flitting about and running along the track in front of us. We had good views of Short-toed, Lesser Short-toed, Calandra, Crested and Skylarks. 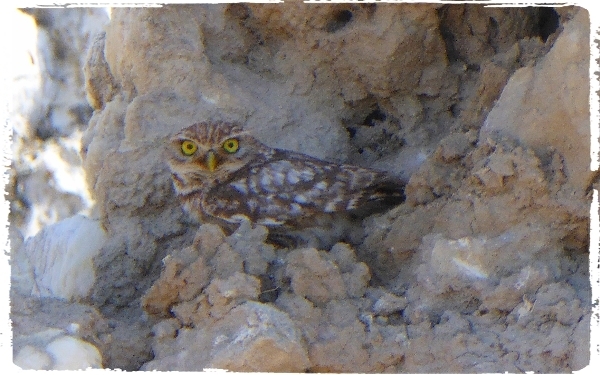 Other birds were great to see too, Stone Curlew, Montagu’s Harrier, Common Raven, Short-toed Eagle and Common Kestrel. We stopped at a small pool of water where from a tiny hide we had great views of Bee-eater, Calandra Lark, Lesser Short-toed Lark, lots of Corn Buntings and Linnets. Some of the group had good views of a Water Rail! Both Woodchat and Iberian Shrikes were found nearby and we had excellent sightings of Black-bellied and Pintail Sandgrouse as they flew directly over us. It was a super visit to this exciting place but we had to move on, so we drove slowly off the reserve and headed for Quinto. By the time we got there the clouds had cleared and it was hot and sunny. 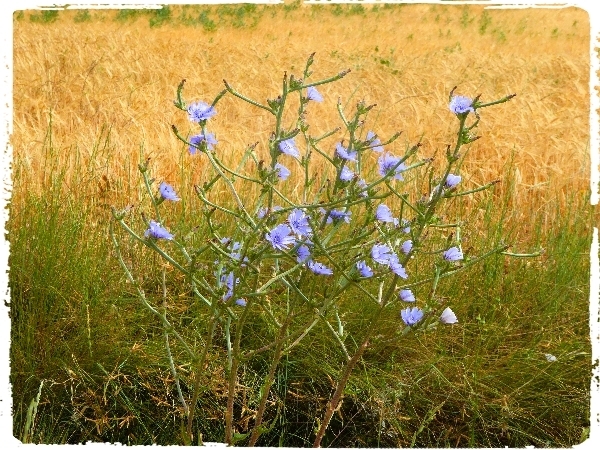 We parked on the bank of the river Ebro and began listing a whole new set of species. The highlights were sightings of Little Bittern, several Purple Herons, Common Nightingale, lots of Black Kites, Melodious Warbler, Cetti’s Warbler, Reed and Great Reed Warblers (heard only). After taking lunch in the main square of Pino de Ebro we drove to Los Monegros where we searched this very arid area for a couple of warblers. We eventually found Spectacled Warbler which shows very well but Dartford Warbler failed to materialize. Two good sightings were of Black-eared Wheatear and a beautifully positioned Little Owl which was sitting in a circular window of a derelict house. From there we drove directly to our hotel in the valley of Hecho some 40km west of Jaca. Our journey took us through some outstanding scenery and the towns of Huesca and Jaca. Our best sighting was of Red Kite. We settled into our rooms and came down to dinner at 8pm which went down well with a glass of local wine.